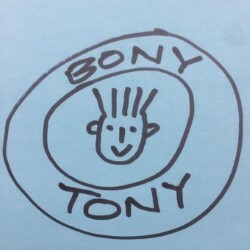 Come and enjoy Bony Tony performing his utter nonsense, if you're daft enough. Why? It's the daftest show anyone's ever seen or heard. And you can join in, if you're daft enough. Relive your childhood stupidity. Bring your kids if you have them, and if you don't have kids, don't bring them. Learn to swim and dance in really stupid ways. If you have a weird laugh, you should definitely come. He collects weird laughs. You will go away asking yourselves how a human with a big brain can be so bonkers.